So for all the drama, this is just curly noodles in chicken soup. I did say that I love the Bakmie GM restaurant in my recent post. Though I failed to take a picture of what I ate there, I have the recipe almost down pat. The recipe is simple, and as delicious as I remember eating. Our Indonesian host gave me clues on how to make it, and I guessed the rest. I was told to cook the noodles in boiling water, and mix it with yummy fat. May it be pork, or chicken fat. The noodles tasted of nothing, but the fat makes it wonderful. I actually brought home some mie keriting bought from Foodmart Supermarket. So we got some chicken thighs, with the fat in it, and separated the fat and diced it. We had some chopped garlic and onion as well. First, the skin, fat, but of the chicken were sauteed until all the fat came out. Then the aromatics were added, then the chicken as well, to slightly fry and brown it. This was seasoned with salt and pepper. This was cooked through, with some of the chicken sticking to the pan. We had to put some water (about a cup) to remove the stuck part, but this was also cooked off. The oil was separated into a bowl along with the yummy brown bits. Then the chicken was put back in, along with a Lee Kum Kee chicken broth mix for hot pot and allowed to boil. The noodles were then dropped in boiling water (different from the chicken broth) and it loosened in the water. It was strained after. Once a bit cool, I tossed this with some of the chicken oil, the browned bits, and a bit of salt as needed. I placed this in a bowl, along with some corn and mushroom (cooked with the chicken). Then I served the whole pieces of chicken along with the soup. This was really really really really really (yes, it deserved 5 really’s) good, that I was immediately craving it the day after, and the day after. But sadly, I only bought one pack of the noodles. Now I need to search for a good local substitute. Cook the chicken fats in a pan until the oil comes out, then add the onion and garlic. Once cooked, add the chicken thighs and season with salt and pepper. Allow to cook through, adding a bit of water if necessary to loosen the chicken from the pan. Once cooked, removed the oil from the pan and set aside. Put in the corn and mushroom. Add enough water and seasoning to the chicken and let it boil. In a separate pan, boil some water. Cook the noodles in the boiling water and strain. Season with the chicken fat, and salt as needed. Put in a bowl. 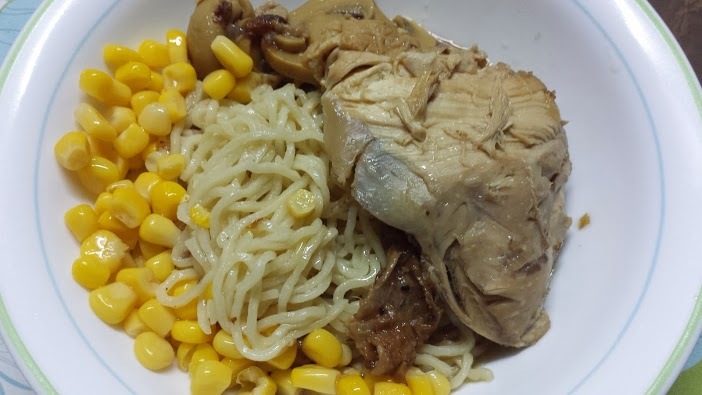 Top with mushroom and corn, then serve with the chicken.